Gambling can impact upon an individual in many ways – it’s not only about losing money. The impacts can be on the person’s (and those around them) mental, physical and emotional wellbeing, creating debt, problems at work, in fact almost every area of their life. Use our assessment tool to check how much of an impact gambling is having on your life. If you are not sure how to use the grading, don’t worry. Focus instead on the statements and see if any apply to you or the person that may have gambling concerns. 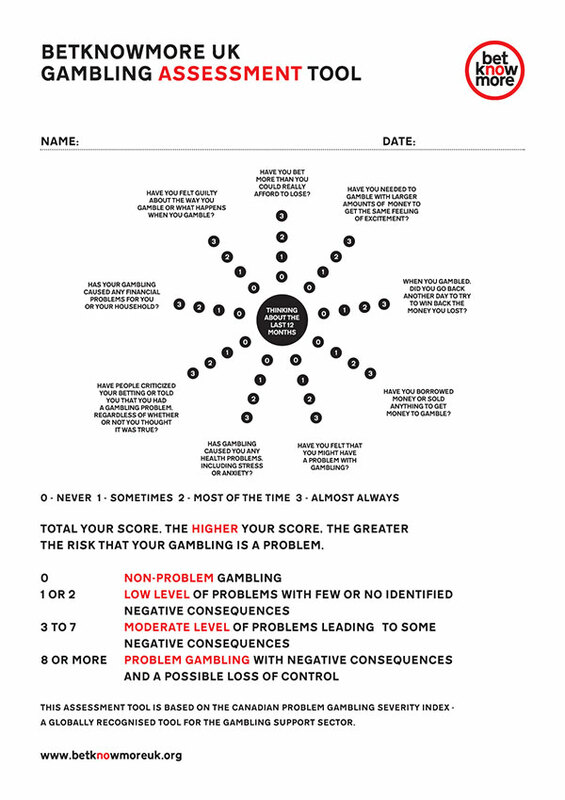 The tool is based on the Problem Gambling Severity Index, a Canadian gambling harm screening tool. A high score may suggest it is time to speak to someone to get help with for you or for the person you are concerned about. If that is the case and you need some advice, please call us on Freephone 0800 066 4827 from 10am to 7pm Monday to Friday or the National Gambling Helpline run by Gamcare on 0808 8020 133, 8am to midnight, seven days a week.